By Euan Loarridge, Blog Editor, University of Glasgow Great War Project. With the centenary of the Battle of Third Ypres (Passchendaele) raging on, the University of Glasgow played host to two inspiring public lectures on the course and impact of the First World War. This post presents a short summary of these lectures and discusses some of the conclusions that were made. Annotated photograph of the Hayworth Family taken around 1910. Seven years later, this family would be irrevocably changed by the Battle of Arras. On April 15th 1917, Second Lieutenant Harry Asher Hayworth was killed in action during the 1st Battle of the Scarpe, part of the wider Battle of Arras (April 9th – May 16th). Less than a month later, on May 12th, Harry’s elder brother, Second Lieutenant Frederick Hayworth, was also killed in action, near the village of Monchy-Les-Preux, just to the south-east of Arras. The two brothers who had lived together, studied together at the University of Glasgow, enlisted together in the Glasgow Highlanders, become officers together into the Argyll and Sutherland Highlanders and trained together throughout 1915-16, subsequently died together in the same offensive. As part of the 2014-18 Centenary Commemorations, Harry and Fred’s story has become the focus of research at the University of Glasgow, teaching at Lenzie Academy and now a short segment on BBC Radio Scotland as part of the World War One At Home series. Biographies for both brothers, recently updated for the anniversaries of their deaths, can be found on the University of Glasgow Online Roll of Honour. This post will expand on their story by reflecting on the support the rest of the Hayworth Family provided Fred and Harry during the War and later how they dealt with their deaths. For this blog, I will be reflecting on my recent biographical research on five men from Glasgow who all fought and died in the Great War. I have chosen to highlight three soldiers I investigated who were graduates from the University of Glasgow and whose names are now commemorated in the University of Glasgow Memorial Chapel. My research background is not in anything related to war studies; rather I research 18th century music. That being said, a large proportion of my PhD was untangling the timelines of several British opera singers and reconstructing more accurate biographical accounts of their careers. In many ways, researching Great War soldiers was very similar; during war small but important details skew the timeline and can make it difficult to track what was happening when. However, I did find another alarming difference in my secondary investigations into these men. What did they do before the war? What were their hobbies? What had been their aspirations if war had never been declared? Did any other family members also serve and did they survive the war? During my initial research, I found a few brief biographical accounts on the internet but I was surprised at the lack of information regarding the character of these men. For quite a few of the names, there was detailed information about the battles and their travel from place to place; all things I had assumed would be quite complicated to trace. There was even grizzly information about how they were killed, but I couldn’t get a sense of who they were as individuals. What did they do before the war; what were their hobbies; what had been their aspirations if war had never been declared; did any other family members also serve and did they survive the war? These are simple questions, but they can transform the story of a soldier allowing him to become more relatable to a 21st century audience and for a family member in search of information, I would hope that it would bring both comfort and intrigue. More importantly, these aspects about a person’s character come through in the war diaries but have not been incorporated into individual histories. It is for this reason I chose to explore the individuality of each man, and while there is some information about their military careers, I also highlight their schooling, family connections and hobbies. 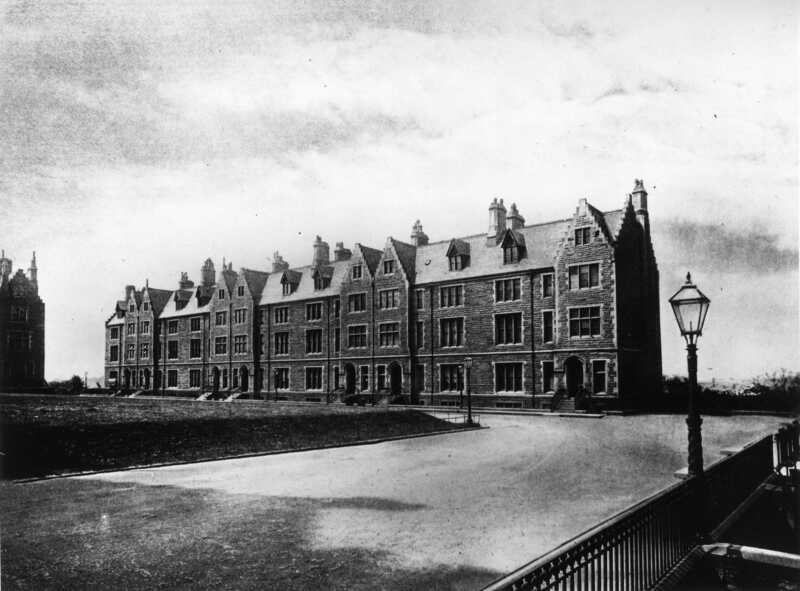 During the Great War, the Glasgow University Magazine (GUM) acted as a mouthpiece for the student body with regards to the experience of campus life during this period of turmoil and grief. Although male members of the publishing team dominate the contributions to the magazine, the occasional Queen Margaret (QM) edition does shed light on the opinions of female students concerning the War and their place within wartime society. Additionally, by studying the GUM as the war progresses, we can see, especially around 1916, the appearance of an increasing number of female contributors to the staff of the regular editions of GUM, suggesting the need to compensate for the absence of male students with the introduction of conscription. Throughout the course of the First World War centenary, the University of Glasgow is researching and remembering the death of each individual on the Roll of Honour. Creating a biography for each person on the online Roll of Honour is a tremendously important endeavour, and not just for fellow historians. I think the task is important because in doing so, everybody on the memorial becomes a real person, with a personality, instead of just a name recorded forever but barely known. By taking the time to uncover information, even just about their (often) short time at the university, those who died in the terrible conflict become more recognisable, and thus easier to relate to. To me this is so important because as time goes on, the history of the First World War becomes more of a distant memory. It is already passing out of living memory and feels firmly in the past – events to be studied by future generations. As time passes, the world that the individuals on the Roll of Honour lived in will become less and less familiar. By creating online biographies that are easily accessible to anybody, hopefully some of the familiarity can be retained. In years to come, when somebody from the class of 2115 studies the Great War, hopefully they can look upon these biographies, and smile to find out that one particular soldier studied the same subject or perhaps lived on the same street as them. By finding familiarities and common connections with the people that came before us, we find it easier to engage with them. Hopefully, then, that student from 2115 will be impassioned to learn more about the Great War, and the fate of that soldier and his battalion, because of a personal cord that was struck when he realised the soldier would have lived next door to him. Maybe then he will go on to question why that soldier was involved in the war, and why that war even happened in the first place. This week is the last week before the start of the next academic year! Professors’ Square saw its first residents move in, in August 1870 in time for the first academic session on the new Gilmorehill Campus and so what better time for the Great War Project to find out what life was like in The Square during WW1? The Glasgow University’s Great War Project is hoping to uncover and share new stories and perspectives from the University during the First World War. During my placement, I researched Professors’ Square, a specific area of the University’s campus and the people that lived there during the war. The 15th World Championships in Athletics begin tomorrow (22nd-30th August) so we thought we’d share the fruits of a sporting themed student placement! Look out on our twitter @GUArchives and @GlasgowUniWW1 where we will be featuring some Great War students who won Sporting Blues awards while at the University of Glasgow. Hello, my name is Anton Ward and I am student who has spent some time over the summer working on a Club 21 Sporting Blues placement. 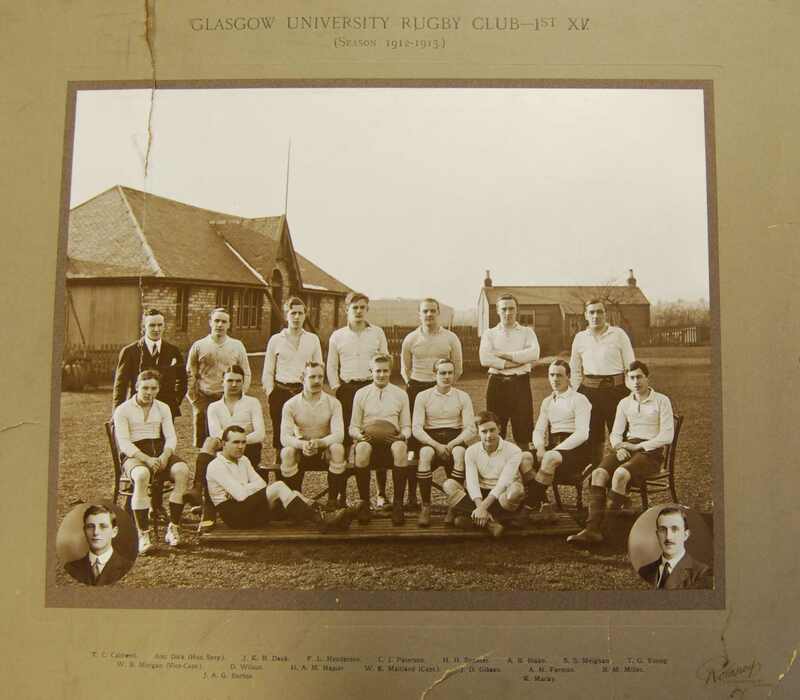 The placement involved researching biographical information on sporting men and women who obtained their Sporting Blues between 1910 and 1914 and writing University of Glasgow Roll of Honour profiles for them. The research was especially interesting because it was like completing a jigsaw puzzle in tying up pieces of information. I would start off with a few key details, such as their graduation date, and try and use these as the foundations for the picture I was building of them. For example, I might see someone’s name mentioned in an edition of Glasgow University Magazine and because I know that this person won a Sporting Blue award in Rugby, I can then connect the two and realise that the magazine’s description of the excellent rugby of a particular person was actually talking about the same person I was researching. This also occurred when connecting military information. For example, several individuals served in the Royal Army Medical Corps and this ties up when you scan the records and see that their degree was in medicine. Although I sometimes felt slightly overwhelmed by all the reference numbers for the archival material, the archive staff were extremely helpful and there were plenty of guides to walk me through everything. It felt a bit like learning a language; at first it all sounds completely unknown but after a while you start to recognise what each code is and what looked incomprehensible to start with now makes sense. Another interesting aspect of the project was seeing how the Glasgow University Magazine (G.U.M) reflected the times. For example there were reports on debates on Women’s suffrage, a cause which was increasing in prominence in the pre-war years. It was strange seeing the contrast between the relative civility displayed in the magazine and the knowledge that these young students would very soon be embroiled in a world war. Looking through the 1911 to 1914 editions of Glasgow University Magazine I could see the pervasiveness of the Officers’ Training Corps. There were multiple reports on their activities and these often contained photographs of the men performing various tasks in preparation for military action. This is quite striking when compared with the relative security I live in today. There is no huge threat of war looming overhead and whilst there were notices in the G.U.M at the time reminding everyone that it was their duty to serve, reading something like that in today’s student magazines would seem very odd. This and the project in general gave me a chance to reflect on my own time at university. Whilst I may be stressing about potential jobs in the future after university, these men would not have known if they would even make it back home at all. 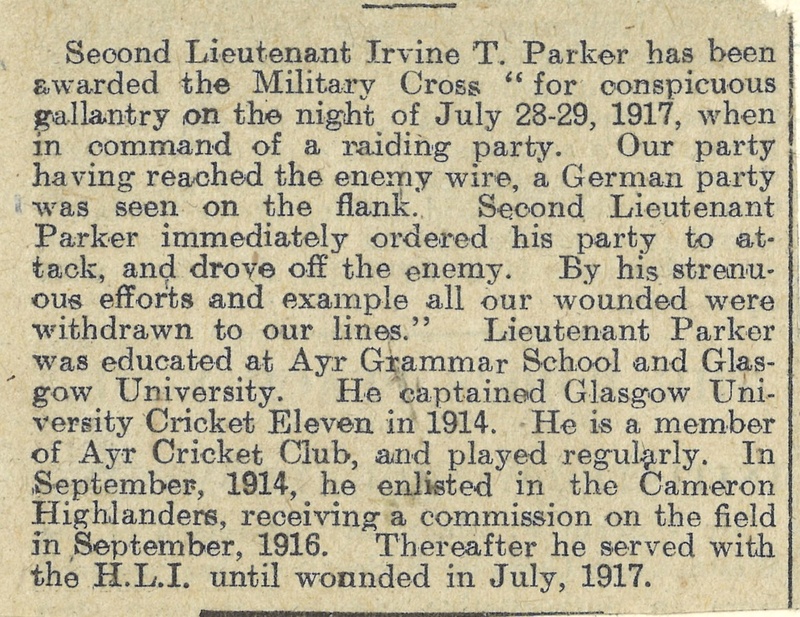 A particularly rewarding aspect of the research was reading the newspaper articles describing how a subject of mine, Irvine Theodore Parker, had earned his medals and it was very pleasant to read that he was later awarded an M.B.E. These particular items were so fascinating because they said so much about the individual and brought his records to life. The M.B.E. shows how he obviously contributed to the community whilst the newspaper clipping of how he earned his medals portrayed him as being very brave in the line of fire and gave a richer glimpse into a sometimes dry world of dates and numbers. Another favourite document is simply a picture of the Rugby Club for the season 1912-1913 which features two of my subjects. Given how hard it can be find to a single picture of any of my subjects, finding two subjects in the same source felt like stumbling upon a goldmine. Seeing these individuals in the same picture also reminds me that these students did actually interact with each other. I would like to say a big thank you to everyone down at the Archive Services for their help, especially those who helped me find such useful sources.